Leading a fast-growing team is a uniquely challenging experience. Startups with a hot product often double or triple in size quickly&#8212;a recipe for chaos if company leaders aren&#8217;t prepared for the pitfalls of hyper-growth. If you&#8217;re leading a startup or a new team between 10 and 150 people, this guide provides a practical approach to managing your way through these challenges. 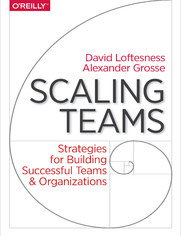 Each section covers essential strategies and tactics for managing growth, starting with a single team and exploring typical scaling points as the team grows in size and complexity. The book also provides many examples and lessons learned, based on the authors&#8217; experience and interviews with industry leaders. What Is a Good Number of Reports? Why Do Core Values and Team Culture Matter? What Breaks When You Grow?